Given a choice of yogurt flavors, I’ll always opt for plain, and I prefer it tangy and unstrained. I don’t even mind if it’s runny. That said, I’m always on the lookout for new brands and new flavors, hoping I’ll find one that I like. 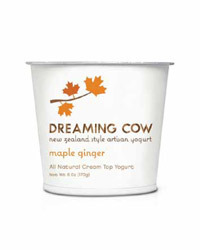 I just discovered Dreaming Cow—made in Georgia by dairy farmers who learned about yogurt-making on the South Island of New Zealand. It’s a farmstead yogurt, made exclusively from the milk from their grass-fed Jersey-cross herd. Since there was no plain to be had, I picked up the ginger-maple. Two spoonfuls are enough to get a good sense of what a yogurt has to offer, but I ended up eating the entire container (it was small). It was the best flavored yogurt I’ve ever tried—not too sweet but with a lovely hint of maple and a clean, just-pungent-enough fresh ginger flavor. The texture is luscious and light, somewhere between a light custard and a just-barely-set panna cotta. Of course, it’s not low-fat—that would be asking too much!—but I can’t wait to try the other flavors.